For some strange reason, despite loving all things breakfast I have waited until now to make homemade granola. 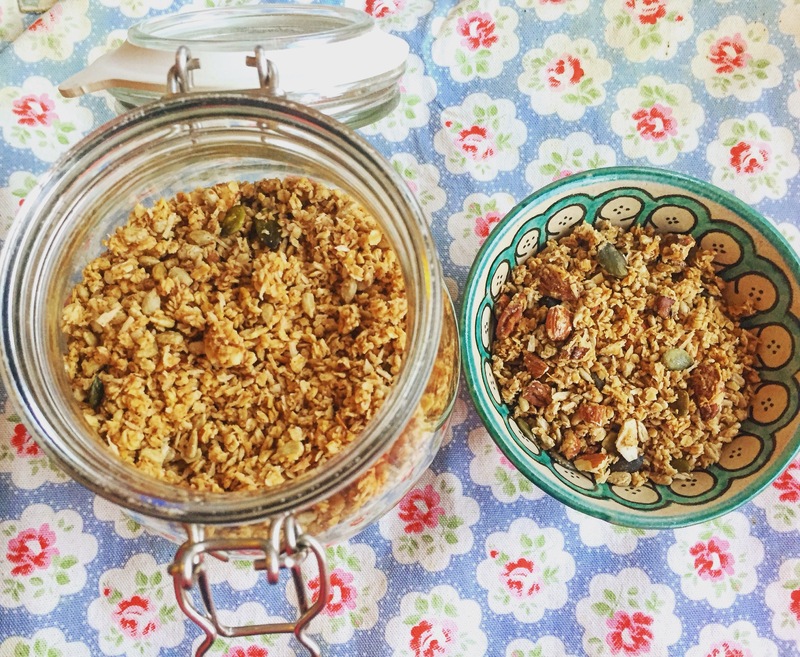 I literally have no idea why as every time I’ve looked up recipe ideas people always say how easy it is and that it makes you never want to get shop bought granola again… they weren’t lying! This granola makes your home smell incredible and it tastes delicious… you could have this plain and simple with milk or layered between yoghurt and fresh fruit for a breakfast parfait. Carbohydrates Carbohydrates are one of food groups our body produces energy from but complex carbohydrates such as oats take a while for your body to breakdown meaning you stay fuller for a lot longer and you don’t have a sudden spike of insulin in your blood. Protein You can use any nuts you like for this recipe but as almonds and pecans are some of my favourites I decided to use them. They are a great form of plant-based protein that fuels your body throughout the day, helping your muscles to grow and repair. Fibre Granola as a whole is full of fibre and this makes it the ideal thing to eat for breakfast as it kick-starts your digestive system ready for the day, ensuring that everything is running smoothly. It reduces the amount of time food is travelling through your colon too which can help prevent harmful bacteria growing and leading to more serious health issues. Vitamins/Minerals Seeds of all varieties are such an easy way of getting essential vitamins and minerals into your body. Pumpkin seeds are especially good for you as they contain Zinc, which is a real immune booster, helping to prevent disease. Fat Coconut oil is high in monounsaturated and polyunsaturated fats and is made up of medium-chain fatty acids. This makes it easier for the body to absorb and convert into energy rather than storing as fat! Great for your heart, lowering your bad cholesterol levels and also your skin, hair and teeth too! In spite of all the goodness these cripsy little clusters give you, I would make them just for the smell alone! I spent most of yesterday opening the jar and just smelling the comforting cinnamon and maple! Honestly its so easy to make and the taste is so amazing, much more flavoursome and with homemade you know exactly whats gone into it. 5 minutes to make and 30 minutes in the oven. Fills a 2 litre jar! Melt the coconut oil using a microwave and then mix this with the maple syrup and vanilla extract in a small bowl. Chop the nuts to your desired consistency, I put some into the food processor and pulsed a few times so that some were halved and others were more crumbly – this is optional though. Combine all the dry ingredients (oats, nuts, seeds, desiccated coconut, cinnamon) in a large bowl. Pour the wet ingredients into the large bowl with the dry ingredients and mix thoroughly until all the oats, nuts and seeds are completely coated. Half the mixture between the two baking sheets, spreading evenly and then pop into the oven. After 15 minutes take out and give them a good stir and switch the trays round so that they have the same amount of time on the higher shelf. Pop back in for another 15 minutes or until they are a nice golden brown. Once done leave out to cool, (enjoy that amazing smell!) then put into an airtight jar. This recipe is dairy free, suitable for vegans and is completely natural. If you are celiac you could use gluten free oats for this and you can alter the above with your favourite nuts/seeds. You could also add dried fruit after it’s cooled too for a sweeter spoonful… enjoy!